As Donald Trump won the American presidential elections, Heiko Maas, the German Federal minister of Justice and Consumer Protection noted: “Die Welt wird nicht untergehen, sie wird nur noch verrückter” (The world is not going to vanish, but it will get crazier). As Trump’s administration acknowledged Jerusalem as the capital of Israel on December 6, 2017, one could easily discern that there is profound wisdom in Maas’ evaluation, at least in the long run. The world will get crazier as this announcement deliberately and grossly distorts history. 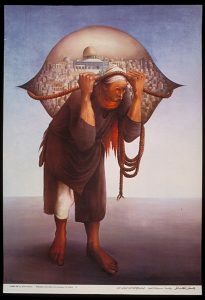 Some refer to ‘the natural, historic right of the Israelis in Palestine’ as a justification for the occupation of Palestine, the expulsion of thousands of Palestinian people, the destruction and depopulations of hundreds of villages and the ongoing establishment of settlements since 1948, the year which marks the Palestinian Nakbah or Catastrophe. In the reference work All That Remains: The Palestinian Villages Occupied and Depopulated by Israel in 1948, edited by Walid Khalidi, you find a detailed description of more than 400 Palestinian villages that were destroyed or depopulated by Israel in 1948. Names of these villages are removed from contemporary Israeli maps, yet, these names are engraved in the hearts of those Palestinian refugees and their families as their real homes that once they were evicted from due to the massacres, fear and panic incited by the Zionists. For instance, the Israeli historian Shlomo Sand admits that Tel Aviv University lies on part of what was once known as the village of Shaykh Muwannis. Furthermore, immigration waves of European Jews who own no inch in Palestine were subsequently facilitated to replace the Palestinians and to change the demography of the country by force. Currently, many Israeli historians dare to speak out, refuting and exposing many of the myths of Zionism, such as Ilan Pappé in his The Ethnic Cleansing of Palestine. Ilan Pappé belongs to the movement of New Historians who challenge the traditional versions of Israeli history. This movement includes Benny Morris, Avi Shlaim , Tom Segev, Simha Flapan, and Shlomo Sand. Many American Jewish leaders spoke against Zionism; such as Alfred M. Lilienthal and Elmer Berger, the executive director of the American Council for Judaism (1942:1955), and professor Norman Gary Finkelstein. Historically, the existence of Palestine is pre-biblical. The Jews were not the original inhabitants of Palestine. “The early inhabitants were semi-nomadic tribes, but about the 20th century B.C. the Canaanites began to settle in the plains and on the coast. They built villages and towns and developed their own culture. In the Bible the country is called ‘the land of Canaan’ (Numbers 34:1, 35:10) or the ‘the country of the Canaanites’ (Exodus 3:17).” So the city was founded around two thousand years before Abraham. That is why Genesis 23 explains that when Sarah, Abraham’s wife, died at the age of one hundred and twenty-seven in the land of Canaan, Abraham addressed the people of Canaan: “I am a foreigner and stranger among you. Sell me some property for a burial site here so I can bury my dead” (Genesis 23:4) NIV. Politically speaking, to single out the Israelis, who ruled for a relatively small period of time, and say they are the real inhabitants of the land is nothing but religious fundamentalism. Historically, Muslims ruled the land for more than 1000 years. Worse still, the expulsion of the native Palestinians and the destruction and depopulations of their villages, based on Zionistic claims, is nothing but a heinous form of extremism. Bringing in religious claims of ownership does not help either, since Muslims have firm religious beliefs regarding Jerusalem. Socially speaking, as illustrated by Richard W. Bulliet in his Conversion to Islam in the Medieval Period, conversion to Islam was a social process. As a matter of fact, it took several centuries for Muslims to be the majority in lands like Egypt, Syria, Iraq and Iran. Interestingly, Muslims remained as a minority in other places, like India, in spite of ruling it for around 1000 years. Compare that with the Spanish Inquisition that expelled all Jews and Muslims from their homes. In Palestine, Muslims did not expel people from their homes or allow immigration waves to change the demography of the land. Muslims in Palestine are mainly the descendants of the native Palestinians. The Jewish population has always been there, getting along with their Arab and Muslim neighbors. So it is a myth that there had always been an Arab-Jewish conflict in the region. After their expulsion from Spain by virtue of the Alhambra Decree issued by King Ferdinand II and Queen Isabella of Spain in1492, many Jews were lucky to immigrate to Turkey, and they were welcomed by Sultan Bayezid II who ridiculed the idea of the Spanish expulsion and under whose reign the Jews enjoyed complete peace. Other Jews immigrated to Egypt as in the case of Moses Maimonides who is considered to be the greatest Jewish philosopher of all times and his genius is a witness for the golden age of the Muslim civilization that held high the torch of knowledge for all. Some other Jews immigrated to North Africa and Italy. The Alhambra Decree was officially overturned on December 16, 1968, at the Second Vatican Council! The world will get crazier as we see many evangelicals and Zionist zealots praising Trump to the hilt and celebrating his decision as a fulfillment of a biblical prophecy, an attitude that changes the whole issue from its political realm into a religious fanatic conflict. Trump’s use of the phrase ‘Israel and the Palestinians’ in his announcement is very alarming. If this is to be read literally, it goes in line with a very dark religious ideology that considers the Palestinians as foreign to their own land and Palestine as non-existent. Are contemporary political rights determined by biblical promises? This question is left for Trump’s administration and advisors to answer if the impetus behind the Jerusalem decision is a religious one, and especially when it is very hard for political analysts to identify any US national interest in this sensitive issue in an already embattled region. It is important to remember that many Orthodox Jews do not believe in Zionism at all as part of their belief system. For instance, Neturei Karta (Lit. the Guardians of the City) was founded in 1938 with their motto Jews United Against Zionism. This organization sees itself as representing the real Jews (Haredi Jews) and opposes Zionism as they believe that the Jews are forbidden to have their own state until the coming of the Jewish Messiah. Similarly, Moshe Menuhin (1893–1983) gave a thought-provoking reassessment of Zionist history in his The Decadence of Judaism in Our Time. Discussing the Jewish arguments against Zionism goes beyond the scope of this brief article. The world will get crazier as this announcement could be clearly interpreted as a change in the US role in the peace process from ‘an honest broker’ into a partner in inflecting more sufferings on the Palestinian people. The world sees Trump’s decision as counterproductive and a clear violation of the international law that considers at least East Jerusalem as corpus separatum or an occupied territory with a special status that rejects Israel’s attempts to settle its citizens there. Acknowledging Jerusalem as the capital of Israel and then expressing a willingness to be committed to the peace process is nothing but a provocative statement. It goes without saying that the Muslim world is now suffering from weak, divided regimes and that most of these regimes do not actually represent their people; therefore, Trump’s decision is not about courage since he estimates that some of the official backlash may be containable, no matter how dire and worldwide it appears. Accordingly, Trump’s incendiary decision is unethically founded on the financial threats to cut off foreign aids to his opponents and the political divisions and domestic conflicts in the Arab world. In the long run, however, the decision seems to be delusional in establishing permanent peace and stability since it fails to take into consideration the power of the masses whose opinion is highly critical yet despairingly ignored. If Trump’s administration sees the occupation as a reality, the Reality is that Jerusalem resides in the hearts of 1.8 billion Muslims. The world will get crazier because states are not to be founded by ‘announcements’ that distort history and deny people their basic human rights as free citizens. If power makes injustice right in the world of politics, history reveals that, in the world of truth, justice will always prevail, no matter how many decades or centuries it may take. History shows that this same Jerusalem was attacked and occupied by the medieval European crusaders for around two hundred years and eventually gained its freedom at the hands of Saladin who revived the weak, divided Ummah of his time. History shows that the Muslim Ummah could get sick, but it never dies. Many Muslim countries were destroyed by the Mongols in 1258, and in around thirty seven years the grandson of Hulegu became a Muslim named ‘Mahmud Ghazan’ in 1295. History is to be measured by centuries, not just the few years we are witnessing. The purpose of evoking history here is two-fold. First, I want to emphasize that lasting and real peace, which we all aspire, can never be achieved by unilateral, unjust decision like that of Trump. Second, one of the greatest weapons Muslims, Arabs and free people worldwide have now is to keep having great hope for freedom, to keep denying Trump’s decision as meaningless and unjust and to keep telling the Palestinian story. Politics aside, al-Quds has always been in the heart of each Muslim and will always remain as such. We pray that God would cleanse all hearts from ignorance, envy, and hatred and that justice would prevail, and peace would spread. Ameen.